This book covers Exam 200-14 in great detail, digging into some of the most important details involved in locking down Windows systems and networks and taking a systemic approach to keeping Windows networks and systems secured. Boasting a one-of-a-kind integration of text, DVD-quality instructor-led training, and Web-based exam simulation and remediation, this study guide & DVD training system gives students 100% coverage of official Microsoft MCSA exam objectives plus realistic test prep. 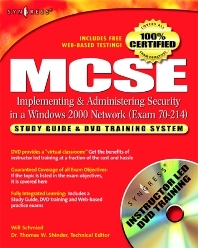 The System package consists of: 1) MCSE Implementing and Administering Security in a Windows 2000 Network Study Guide: Syngress's 1 million study guide users will find tried-and-true features and exciting new enhancements; included are step-by-step exercises plus end-of-chapter bulleted objectives reviews, FAQs, and realistic test prep questions in the same format as those on the actual exam. 2) Security DVD: A full hour of instructor-led training, complete with on-screen configurations and networking schematics, demystifying the toughest exam topics. 3) Security from solutions@syngress.com. Accompanying Web site provides students with authentic interactive exam-simulation software that grades their results and automatically links to e-book study guide for instant review of answer concepts. Covers Critical Security Exam. This exam was created to meet the demand for a security-based examination which verifies an administrator's ability to implement and maintain secure Windows 2000 network. Fast growing certification gains in popularity. The new MCSE certification launched in March and already there are 17,000 MCSA-certified professionals (data as of May, 31, 2002, Microsoft Corp.). This exam also serves as an elective for MCP status and other certifications. Best selling author with over 150,000 copies in print. Tom Shinder's books have over 150,000 copies in print and he's a regular speaker at the security industry's leading Black Hat Briefings. His Configuring ISA Server 2000, has sold over 45,000 units worldwide in a year. First in-depth security exam from Microsoft. As Microsoft certification guru Ed Tittell points out, "this is the first real, nuts-and-bolts security exam in the MCP line-up. This exam is the first MCP test to really dig into some of the most important details involved in locking down Windows systems and networks in the first place, and to step systematically through the processes involved in keeping Windows networks and systems secured thereafter." $2,000 worth of training wrapped in a $60 book/DVD/Web-enhanced training system. Certification Magazine's 2001 reader survey revealed that the average certification costs nearly $2,000. So our low-priced study package delivers unsurpassed value for cost-conscious IT departments and trainees. Cryptography and You:What is it All About?